Kerry is my daughter, she gave me a dollhouse kit for my last birthday. Kerry loved this little house, and said it made her think of the summer cottage she has always wanted. I decided to make it into a miniature of her dream cottage. This house kit is the Orchid by Greenleaf. 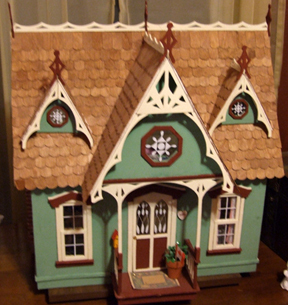 I am more familiar with building houses from scratch, but I had made a couple of Greenleaf dollhouses before I made this one. This dollhouse is much cuter on the exterior than the houses I make from scratch. I love all the fancy gingerbread trim. I figured my daughter would want to keep it in the living room, so I chose some paint colors which would fit into the decor. There are so many tiny pieces to this dollhouse, and they all needed sanding! 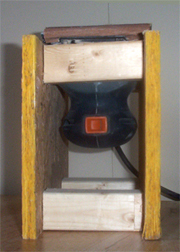 .After sanding every evening for a week, I came up with an idea; I made a little stand for my electric sander, which held the sander upside down. This made the sanding job much easier, I could just hold each piece against the sander. It took me a whole week to shingle the roof. I must have glued the shingles on a bit too close together because (eek! ), I ran out of shingles. You can see in the photo below that I had to use some veneer to finish the top of back roof. 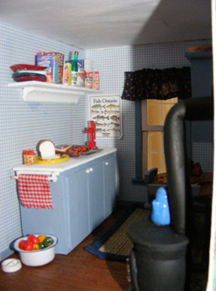 This dollhouse is quite small, no pun intended, I mean small when it comes to adding furniture. I didn't put the staircase in because I wanted the maximum space possible. I don't have a lot of money, so the challenge with the dollhouse was to be as economical as possible. I purchased the bathroom pieces, and have used a couple of Michael's hutches, as well as some dollar store furniture. 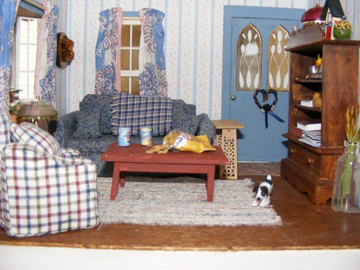 I have not seen dollhouse furniture in the dollar stores for several years now, but in the past I bought a lot of it, while I had the opportunity. The kitchen table and chairs, coffee table and bedroom dressers are all dollar store items. A cottage has to have a wood stove, so I added the chimney. It is made from covering a piece of wood with a thin layer of pollyfilla. When the pollyfilla is dry I painted with several brick type colors. Then after the paint has dried I scratch out the lines for the bricks. If I had to do it again I would make the chimney a lot taller, so that it could be seen from the front . The wallpapers and the bathroom floor were all from my jennifersprintables web site. I like to personalize dollhouses. 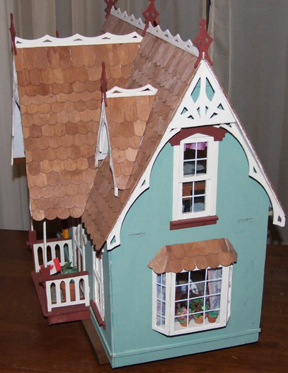 My mother passed away in 2000, I have inherited a lot of her things and have been able to use a few in this dollhouse. The quilt and sheets on the bed are made from my mum's old hankie.The curtains in the livingroom are also made from one of her hankies. The pump on the kitchen counter had been given to me by my youngest grandson, I knew he wouldn't mind if I used it in his Mom's dollhouse. 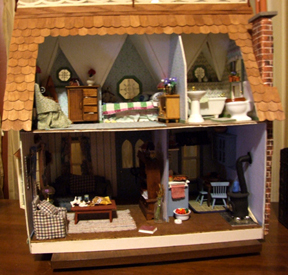 Strangely this dollhouse, like my own dollhouse, has full plumbing in the bathroom and a hand pump in the kitchen?? It's just that I love tiny toilets and I love tiny hand pumps lol. 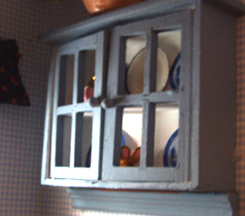 The little kitchen cupboards are made from a wooden tea box from the dollar store. See how here. This cupboard is mounted on the wall above the kitchen table. The plates are actually printies sprayed with a high gloss spray. There is a lot of food on the shelf over the sink, plus a loaf of bread and a basket of strawberries. The wood stove was made from a very old thread spool (which had been my mum's), some jeweler findings for the feet., Polymer clay top and door. I was stumped as to what to use for the stove pipe, I thought about it all summer and couldn't think of anything. Finally I found the solution at my trusty dollar store, it is a hair curler! they come four to a pack for $1. It was perfect, easy to paint, bendable and very lightweight. My daughter likes diet Pepsi, so I put a can on the coffee table, as well as the bag of chips. The little dog I made from polymer clay. 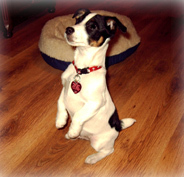 It is their Jack Russell Terrier, Oscar. There are pictures of the real Oscar at the bottom of this page. In the attempt to make the cottage look old and well worn, I used the crackle paint on the coffee table. It doesn't show well in the picture, but I liked the results and want to use it again. The sofa and chair are made from cardboard and fabric. Summer cottages which we have visited are often furnished with odds and ends that might otherwise be thrown out. 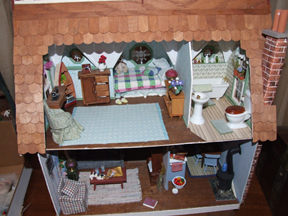 I tried to give the dollhouse that sort of mismatched cozy look. I used one of my mother's hankies to make the curtains livingroom .This particular hankie is quite old. 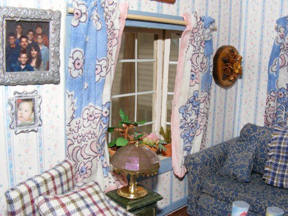 The curtains don't really go with the wallpaper all that well, but the idea of this dollhouse was to give it the look of a summer cottage. I didn't want everything to look perfect, but more as if the furniture pieces etc. 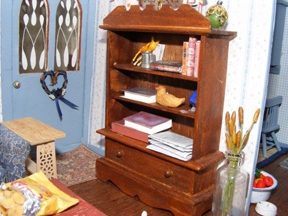 were well worn and mismatched.Another way that I personalized this dollhouse was to add framed photographs of loved ones on the wall.A Michael's hutch holds books, newspapers, magazines and other odds and ends. There is also a Scrabble game, our families favourite board game.The house is not wired for lights, so I have some pretend lamps that I bought at the dollar store. The lamps are actually crystal ornaments/brass, but I painted them with nail polish. The bedroom rug is made from a placemat which my mother had woven herself, many years ago. I pondered for weeks whether or not I should cut up this placemat. I finally decided that Mum would rather have it in her granddaughter's dollhouse where it will be seen, than stashed in the back of my linen closet where it might never see the light of day. 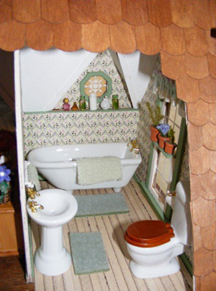 'Making Doll's House Miniatures with Polymer Clay', which has very comprehensive instructions for making bathrooms. After reading how much clay and supplies I would need to do this, I couldn't see how it was any cheaper, which was the main concern. The floors of the dollhouse are mostly just stained and but the bathroom has a printable floor.I had to do this because of eliminating the stairs, there was an opening for the stairs on the second floor. The little bottles of shampoo, lotion etc are made from beads. He is a small dog with an enormous ego. 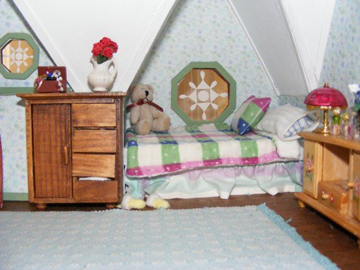 Printables Tutorials Dollhouses and Miniature projects. 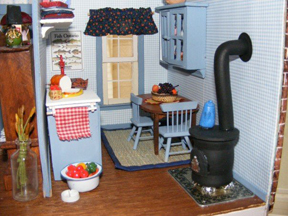 This link will take you to Jennifer's[my] dollhouse.